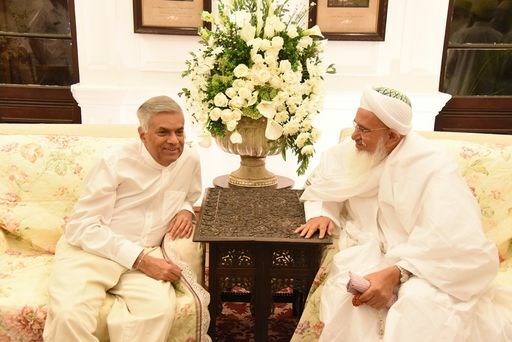 Prime Minister Wickremesinghe in conversation with His Holiness Syedna Mufaddal Saifuddin. Prime Minister of Sri Lanka, Hon. Ranil Wikremesinghe called on His Holiness Dr Syedna Mufaddal Saifuddin at “Saifee Villa”, Colombo on Monday. Syedna congratulated the PM on completing 40 years of public service, and for the country’s 70th independence celebrations. The PM recalled the community’s socioeconomic contribution to Sri Lanka. The Prime Minister sought His Holiness’s blessings and Syedna prayed for peace and prosperity in the Island. Sri Lankan Prime Minister, Ranil Wickremesinghe has asked His Holiness, Syedna Mufaddal Saifuddin, the 53rd Dai al-Mutlaq and current leader of the Dawoodi Bohra community, to help the Sri Lankan government hold an international investment conference in Mumbai in September this year. Wickremesinghe made this request to the Spiritual Leader, who was on a visit to the island country, when he called on him in Colombo on Monday. Syedna Mufaddal Saifuddin assured his fullest support to the Prime Minister and his government. The Dawoodi Bohras, a global community of Shia Muslims whose spiritual center is in Mumbai, are a thriving business community, who are well disciplined and helpful as the Sri Lankan Prime Minister put it. Wickremesinghe described the Bohras as a business community which minds its business and lives in peace and harmony with other communities in Sri Lanka and elsewhere in the world. “You have played a significant role in the economic development of Sri Lanka,” the Prime Minister said. On his part, Syedna Mufaddal Saifuddin pledged the community’s support to Sri Lanka’s development and wished Wickremesinghe continued success in serving the people of the island nation for many more years to come. The meeting between the Sri Lankan Prime Minister and the Spiritual Leader was meant to mark the 70th year of Sri Lanka’s independence and the 40th year of the Prime Minister’s political life. The Prime Minister was told that successive Spiritual Leaders of the Dawoodi Bohras have never failed to advise their followers to be loyal and supportive of the countries they live in, a dictum the community has been following to the letter. Sri Lankan Bohra Community officials who were present at the meeting told the Prime Minister about the local community’s desire to hold the next “Moharram” in Colombo on a massive scale with 40,000 to 50,000 participants from abroad and sought the government’s help to organize it. The Prime Minister said that he would ‘certainly’ extend all help. Syedna also told the Prime Minister of his community’s desire to work for the development of war-devastated Jaffna and the Northern Province which had a strong resident Bohra community before the war started. Syedna Mufaddal Saifuddin has visited Jaffna three times and has helped renovate the Bohra mosque on Hospital Road in Jaffna. He is keen that the Bohra community should go back and endeavor to re-start or start new businesses and entrepreneurial activities there. The Prime Minister welcomed the idea of increasing investments in Jaffna. He also thanked the Spiritual Leader for visiting the island country.